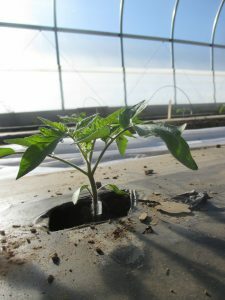 Home > Articles > 638 > Is it Economically Sound to Grow Grafted Tomatoes? Awareness of tomato grafting has increased tremendously in the past years. Some growers fall in love with this technology and apply it to every tomato they grow. While others find this technology is not cost effective. The growers who have successfully adapted this technology are often small-scale, high tunnel or greenhouse growers who have mastered the grafting technique. They graft tomatoes by themselves and often can achieve a high survival rate. In this case, the added cost for grafted plants is mainly the cost of rootstock seeds, which is roughly 30-50 centers per plant. A small amount of yield increase could easily compensate for the added cost. This is particularly true for tomatoes grown in high tunnels that often sell at a higher price. In situations that farmers buy grafted plants, the cost rangs from $1 to $3 per plant. Farmers would expect a high percentage of yield increase to compensate for the cost. In our on-farm trials, we observed yield increase of grafted tomatoes ranged from 0-100%. From an economic standpoint, if yield increase reached 100%, the extra cost for grafted plants is almost neglectable. While there is no reason to use grafted plants if they did not increase yield. Now the question is under what circumstances can grafting increase yield? In general, the yield increase is more prominent in high tunnel production. If we look at the status of grafting utilization in other counties, it is clear that the use of grafted vegetables has always been associated with intensive production systems in protected environment. The intensive production often accompanies with various biotic and abiotic stresses. However, there has been a misunderstanding that grafting can solve every problem, of course, this is not true. Although evidence indicated that grafting is effective in controlling soilborne diseases, it is important to understand grafting does not control all the soilborne diseases. Actually, tomato diseases that can be effectively controlled by grafting are limited to fusarium wilt, bacterial wilt, root-knot nematode and maybe a few more. Root-knot nematode and bacterial wilt most likely occur in warmer areas and seldom become a problem in Indiana (except root-knot nematode in high tunnels). With that said, the main benefit of tomato grafting does not always apply in our area. In addition to disease resistance, most commercial rootstocks have strong root systems that confer higher vigor to scion cultivars as compared with their nongrafted counterparts. Because of the increased vigor, grafted tomatoes generally have a higher yield even without disease pressures. Tomato cultivar and rootstock selections play a major role in the vigor-related yield increase. Some tomato cultivars respond very well to vigorous rootstocks, while others do not. Unfortunately, there are almost endless rootstock and scion cultivar combinations. It often requires farmers to find out whether their favorable cultivar is suitable for grafting or not. I do not have experience with all the tomato cultivars, but from what I have observed, it seems that the cultivars generally have a lower yield or have difficulties in setting fruit hardly have a positive response toward grafting. A common concern on grafted tomato plants is that they put too much energy into vegetative growth that leads to bushy plants. Some of the newer rootstocks are marketed as having a higher proportion of energy putting into the fruit (more generativity). I do not fully understand what this statement means. But from our preliminary study, we found tomatoes grafted onto the more generativity rootstocks tend to have a higher yield than traditional rootstocks. However, the grafted plants are still bushy, having a strong vegetative growth. Excessive vegetative growth could create a high humidity micro-environment that is conducive to foliar disease development. This is particularly a concern for tomatoes grown in greenhouse and high tunnels in the early season. Major greenhouse tomato diseases such as leaf mold, gray mold, and white mold are associated with high humidity. 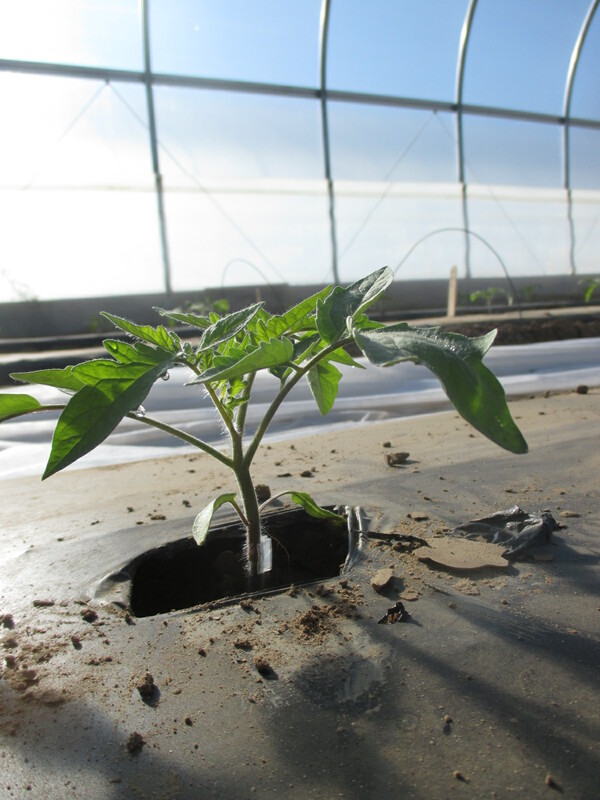 Our study showed that grafted tomatoes could be more susceptible to leaf mold. This study also indicated that grafting significantly increase tomato yield only when leaf mold is well controlled. There are many other things to think about when making the decision to grow grafted tomatoes, such as fertility management, pruning system, spacing, growing in soil or pot etc. If you are interested in setting up a ‘scientific’ experiment to explore this by yourself, I would be more than happy to help. You can find a step-by-step guidance of grafting tomatoes in this video https://www.youtube.com/watch?v=7Ufx66Isf88&t=1s , as well as this extension bulletin https://extension.purdue.edu/extmedia/HO/HO-260-W.pdf. If you need more assistance, please contact me at guan40@purdue.edu or (812) 886-0198.